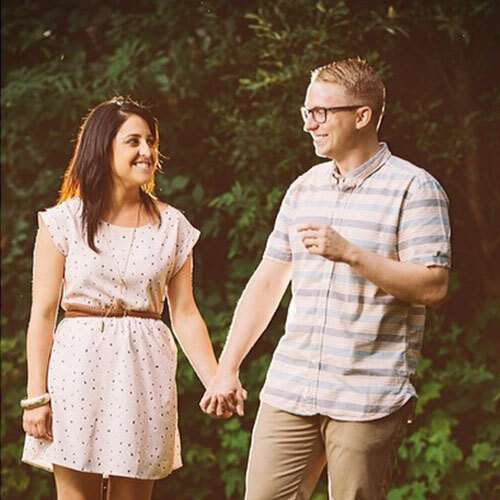 With the winter holidays fresh in our memories, we’ve been searching for fun date night ideas. If your wallets are a little lighter than normal due to the holidays, we understand you. With that in mind, we wanted to factor both the winter season and our budget into this date idea. We landed on camping indoors because who doesn’t like to build a tent out of blankets? It’s not just for kids anymore my friends. I’m sure most can agree it’s good to mix things up every once in a while, so why not do that with your house? Now you can go the whole nine yards and pull out the sleeping bags, assemble the tent in the house and drag out camping equipment but let’s face it, you are at home and camping can be so much more comfortable. We drug our mattress out of the bedroom and laid it in the middle of our apartment, spread all of our blankets around, hung some of our Christmas lights up to create that “starry night” feeling and lit some candles to get a camp fire ambiance. Now that we have set the scene we can’t forget about camping food. We opted to not light a fire in the middle of our floor. Instead we thought why not have a little fun with pigs in a blanket? It’s like hotdogs over a camp fire, but a little more fancy and date worthy. It requires tiny hot dogs and a stove so we figured it would fit perfectly with our theme. Check out some of our creative and tasty variations below. To top off the night, we also got a little creative with our s’mores and bought specialty chocolates like dark chocolate with sea salt and chocolate with caramel. We were gifted a Hershey’s s’mores making machine for Christmas. Imagine a blow drier that shoots air vertically and you’ve basically got the same thing. We figured this would be the next best thing to roasting marshmallows over an open fire and believe it or not the s’more machine did a great job. Our marshmallows were roasted to a perfect golden color. If you don’t have this oddity laying around the house, you can always use an oven or a fire place. 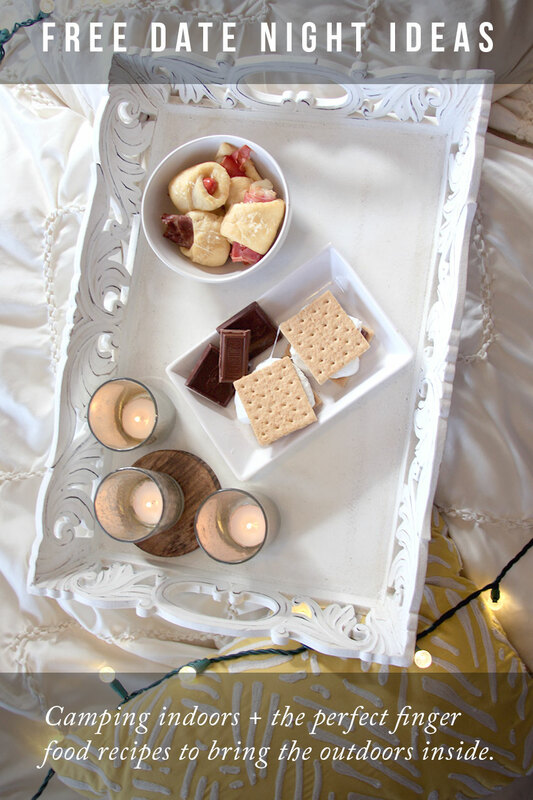 With our snacks baked and our s’mores melted to perfection, we enjoyed time talking and laughing underneath the Christmas light star scape. This is probably one of the simplest preparations for snacks and sometimes it should be that easy! Preheat your oven to 375 degrees Fahrenheit. Lay out two baking sheets and lightly grease with oil. Open up the crescent roll dough packages and lay flat off to the side. 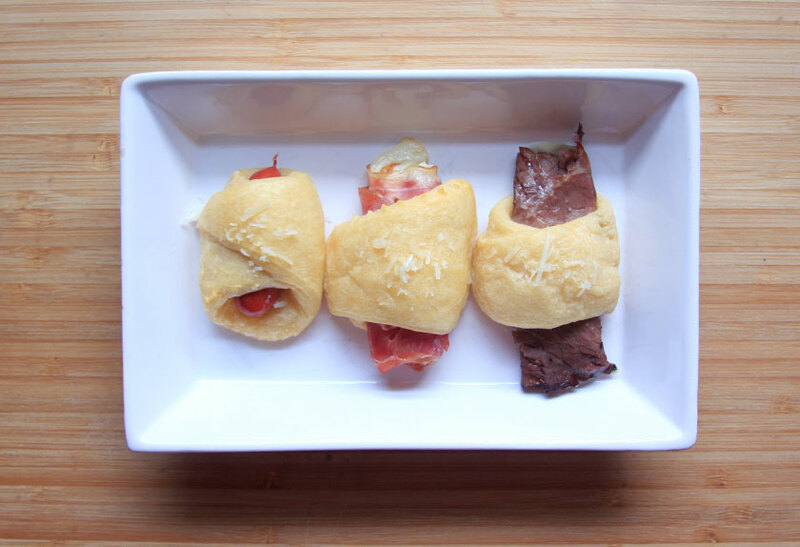 Cut the pre-measured crescent roll dough into pieces that are half the size of the original. Pick up one little hot dog at a time and roll them with one piece of dough. Place on the baking sheet and bake for about 12-15 minutes or until the dough is a light golden brown. Cut the pre-measured crescent roll dough into pieces that are half the size of the original. Pick up one little hot dog at a time with one slice mozzarella and wrap in one slice of prosciutto. Then wrap in the crescent roll dough. Place on the baking sheet and bake for about 12-15 minutes or until the dough is a light golden brown. Cut the pre-measured crescent roll dough into pieces that are half the size of the original. Pick up a half slice of roast beef and wrap a slice of mozzarella cheese with the roast beef. Then wrap in the crescent roll dough. Place on the baking sheet and bake for about 12-15 minutes or until the dough is a light golden brown. Once all of your pigs in blankets have baked, melt 2 tablespoons of butter and lightly brush onto the cooked dough. Sprinkle parmesan cheese on top and enjoy with your special someone. Great ideas! I used to do something similar with the children on dull winter days. You’re never too old for a blanket fort/tent! Absolutely, it’s fun to mix it up every once in a while.